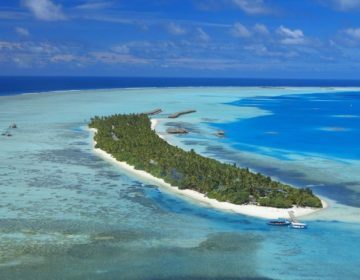 Spread across two islands in the deserted Dhaalu Atoll, Niyama Private Islands Maldives is a luxurious resort with takes ‘chilling’ and ‘playing’ to new levels. Offering a fresh, innovative take on tropical-island luxury, Niyama Private Islands Maldives is home to beautifully appointed over-water villas, highly acclaimed restaurants, and elegant bars, an exclusive spa and wellness center, and a Subsix underwater club offering a wide variety of watersports and underwater adventures. 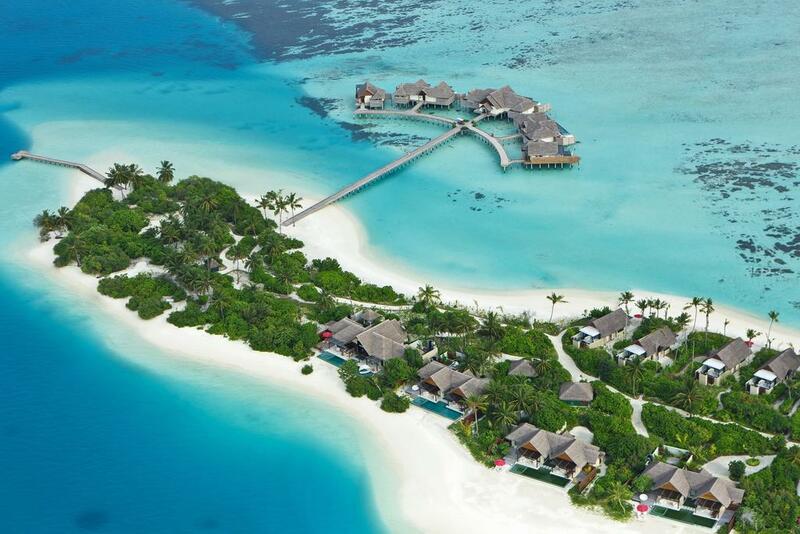 Niyama Private Islands Maldives boasts mesmerizing accommodations in a variety of spectacular villas and residences with naturally-inspired design, bespoke décor and furnishings, and luxury amenities. 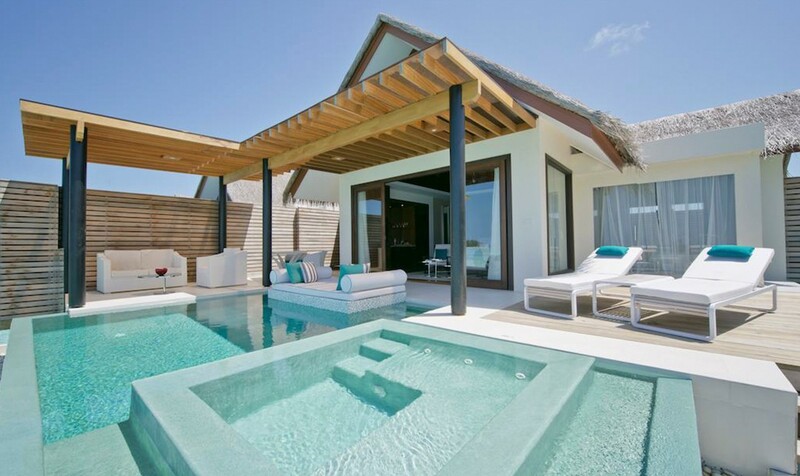 Villas range from between 135 to 770 square meters in size, as well as a playground of five ultra-chic villas, all with private pools offering over-water seclusion for up to 14 adults and eight children with a private chef, two dedicated Thakurus (butlers), and a housekeeper. Several restaurants and elegant bars provide a wealth of globally-inspired cuisine from all four corners of the globe including fresh seafood, handcrafted Asian fare, and African and South American flavors. 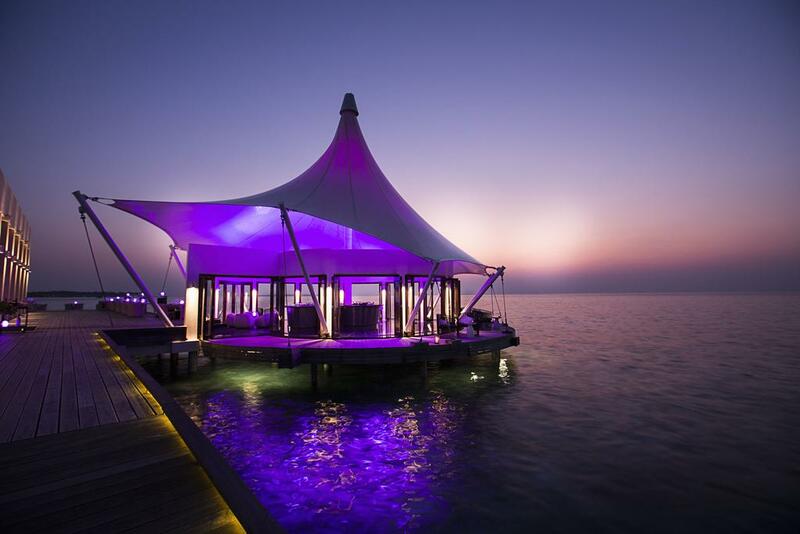 Champagne breakfasts, wine tastings, and weekly glow parties can be enjoyed at the Subsix underwater restaurant and bar, and Bar Fahrenheit hosts live music every evening. Niyama Private Islands Maldives is a playground of fun with a wealth of activities and adventures to enjoy, ranging from surfing some of the Maldives’ top surf breaks, snorkeling and scuba-diving the incredible reefs around the islands, swim with hammerhead sharks on marine-biologist-led nature trips, and skip over the water on jet skis, wake-boards, catamarans or fun tubes. Elegantly appointed and stylishly decorated weathered-wood villas boast soaring ceilings, light, airy living spaces with floor-to-ceiling doors and windows that flow seamlessly onto outdoor wooden decks that float over the water. 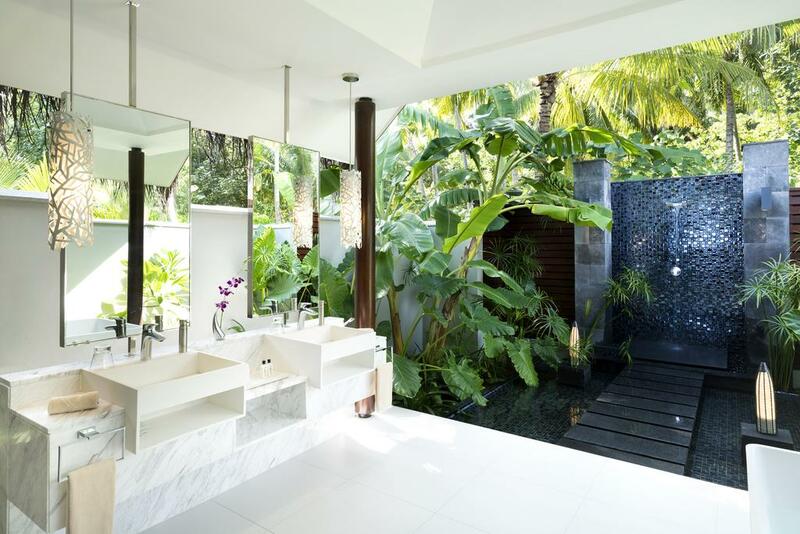 Secluded hardwood decks have alfresco rain showers, cushioned daybeds, infinity pools, and Jacuzzi tubs, while interiors have spacious bedrooms and en-suite bathrooms with glass-enclosed walk-in showers, soaking tubs, double vanities, and designer toiletries. 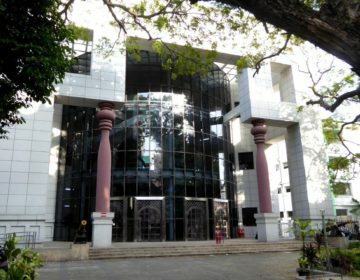 State-of-the-art amenities include LCD satellite televisions, BOSE home theater systems, and around-the-clock Thakuru (butler) services. Niyama Private Islands Maldives Beach Villas offer 135 square meters of space and feature king bedrooms with en-suite open-air bathrooms with covered and outdoor rain showers, spacious living areas with deluxe amenities such as in-room entertainment systems with LED TVs, Bose surround sound entertainment systems, and international movie selections and fully-stocked fridges brimming with drinks and treats. Expansive wooden decks have sun loungers, dhoni-shaped swings, and dining tables and offer direct beach access and 24-hour butler services. Niyama Private Islands Maldives Beach Pool Villas offer 190 square meters of space and feature king bedrooms with en-suite open-air bathrooms with covered and outdoor rain showers, spacious living areas with deluxe amenities such as in-room entertainment systems with LED TVs, Bose surround sound entertainment systems, and international movie selections and fully-stocked fridges brimming with drinks and treats. 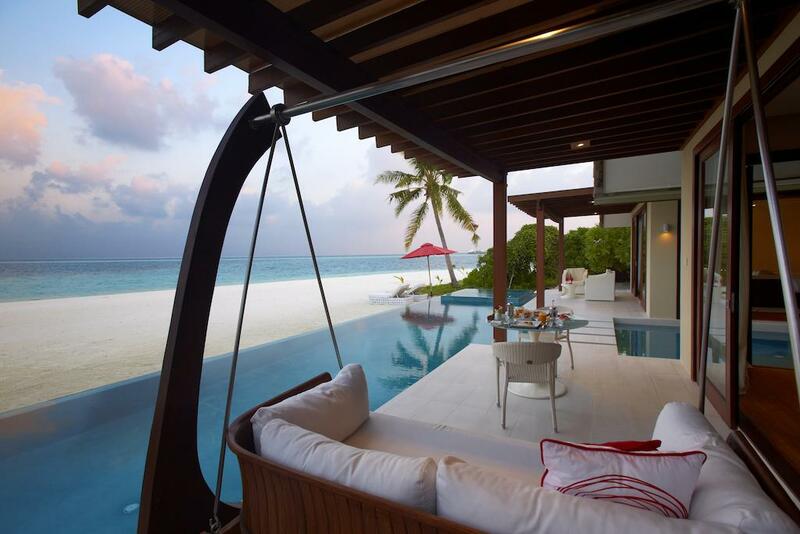 Expansive wooden decks have private swimming pools, sun loungers, dhoni-shaped swings, and dining tables and offer direct beach access and 24-hour butler services. Niyama Private Islands Maldives Water Pool Villas offer 175 square meters of space and feature king bedrooms with en-suite open-air bathrooms with covered and outdoor rain showers, spacious living areas with deluxe amenities such as in-room entertainment systems with LED TVs, Bose surround sound entertainment systems, and international movie selections and fully-stocked fridges brimming with drinks and treats. 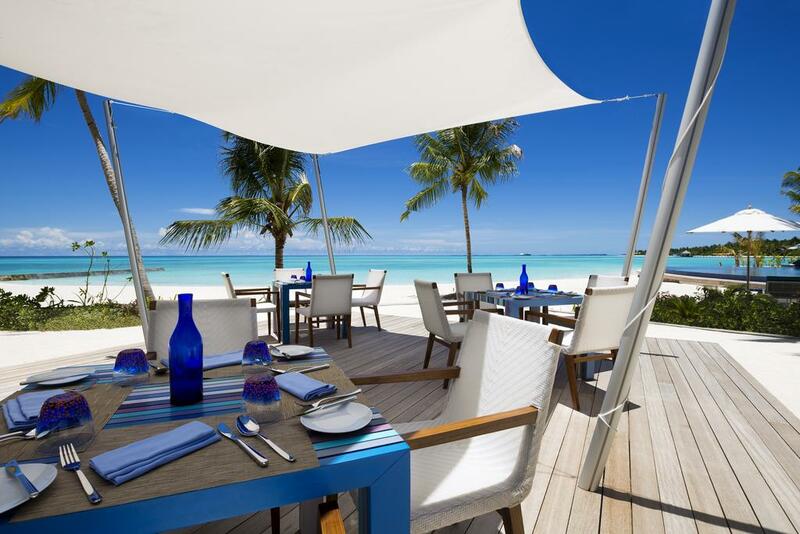 Expansive wooden decks have stairs leading to the lagoon, private swimming pools, sun loungers, dhoni-shaped swings, and dining tables and offer direct beach access and 24-hour butler services. Niyama Private Islands Maldives Deluxe Water Pool Villas offer 190 square meters of space and feature king bedrooms with en-suite open-air bathrooms with covered and outdoor rain showers, spacious living areas with deluxe amenities such as in-room entertainment systems with LED TVs, Bose surround sound entertainment systems, and international movie selections and fully-stocked fridges brimming with drinks and treats. 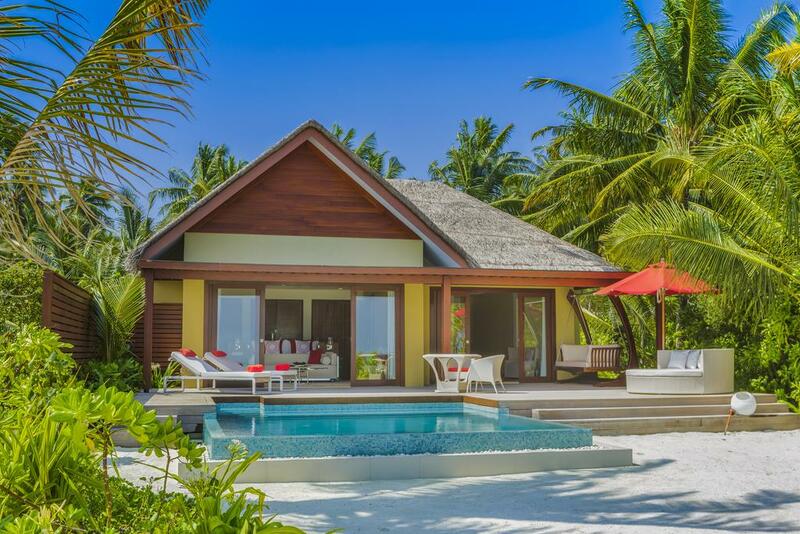 Expansive wooden decks have stairs leading to the lagoon, private swimming pools, Jacuzzi tubs, sun loungers, dhoni-shaped swings, and dining tables and offer direct beach access and 24-hour butler services. Niyama Private Islands Maldives Family Beach Pool Villas offer 225 square meters of space and feature king bedrooms with en-suite open-air bathrooms with covered and outdoor rain showers, spacious living areas plush sofas and guest bathrooms, and deluxe amenities such as in-room entertainment systems with LED TVs, Bose surround sound entertainment systems, and international movie selections and fully-stocked fridges brimming with drinks and treats. 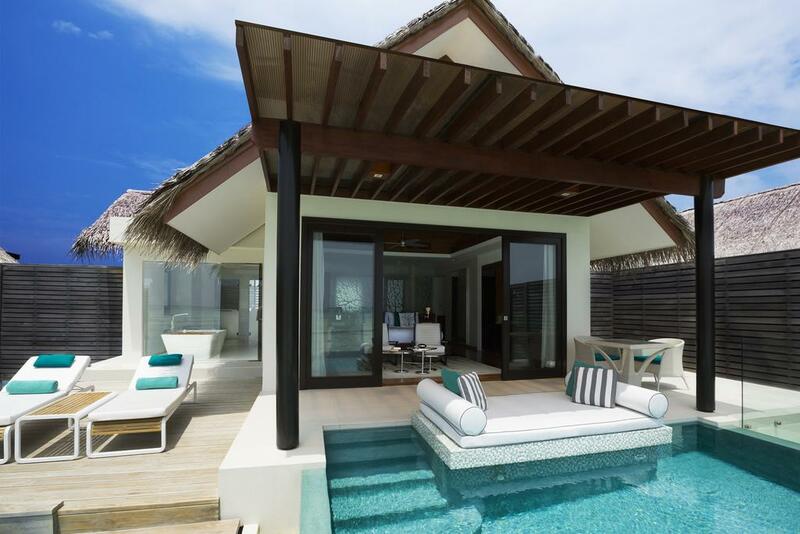 Expansive wooden decks have stairs leading to the lagoon, private family-size plunge pools, sun loungers, day beds, dhoni-shaped swings, and dining tables, and offer direct beach access and 24-hour butler services. A special welcome gift and turndown for children are also available. Niyama Private Islands Maldives One Bedroom Beach and Water Pool Pavilions offer 340 to 400 square meters of space, and feature king bedrooms with en-suite open-air bathrooms with covered and outdoor rain showers, spacious living areas plush sofas and guest bathrooms, and deluxe amenities such as in-room entertainment systems with LED TVs, Bose surround sound entertainment systems, and international movie selections and fully-stocked fridges brimming with drinks and treats. Butler’s pantries have extra fridges, ice-makers, microwaves, and wine refrigerators, and expansive wooden decks have stairs leading to the lagoon, private plunge pools, Jacuzzi tubs, sun loungers, day beds, dhoni-shaped swings and dining tables, and offer direct beach access and 24-hour butler services. Guests enjoy a pampering foot ritual on arrival, and fresh coconuts and cooling box with cold face towels are delivered daily. Niyama Private Islands Maldives Two Bedroom Ocean Pool Pavilions offer 515 square meters of space and feature king and twin bedrooms with en-suite open-air bathrooms with covered and outdoor rain showers, spacious sunken living areas plush sofas and guest bathrooms, and deluxe amenities such as in-room entertainment systems with LED TVs, Bose surround sound entertainment systems, and international movie selections and fully-stocked fridges brimming with drinks and treats. Butler’s pantries have extra fridges, ice-makers, microwaves, and wine refrigerators, and expansive wooden decks have stairs leading to the lagoon, private plunge pools, Jacuzzi tubs, sun loungers, day beds, dhoni-shaped swings and dining tables, and offer direct beach access and 24-hour butler services. Guests enjoy a pampering foot ritual on arrival, and fresh coconuts and cooling box with cold face towels are delivered daily. Niyama Private Islands Maldives Two Bedroom Beach Pool Pavilions offer 635 square meters of space and feature king and twin bedrooms with en-suite open-air bathrooms with covered and outdoor rain showers, spacious sunken living areas plush sofas and dining areas with cocktail bars, and deluxe amenities such as in-room entertainment systems with LED TVs, Bose surround sound entertainment systems, and international movie selections and fully-stocked fridges brimming with drinks and treats. Butler’s pantries have extra fridges, ice-makers, microwaves, and wine refrigerators, and expansive wooden decks have stairs leading to the lagoon, private plunge pools with fiber optic lights and underwater speakers, Jacuzzi tubs, sun loungers, day beds, dhoni-shaped swings and dining tables, and offer direct beach access and 24-hour butler services. Guests enjoy a pampering foot ritual on arrival, and fresh coconuts and cooling box with cold face towels are delivered daily. 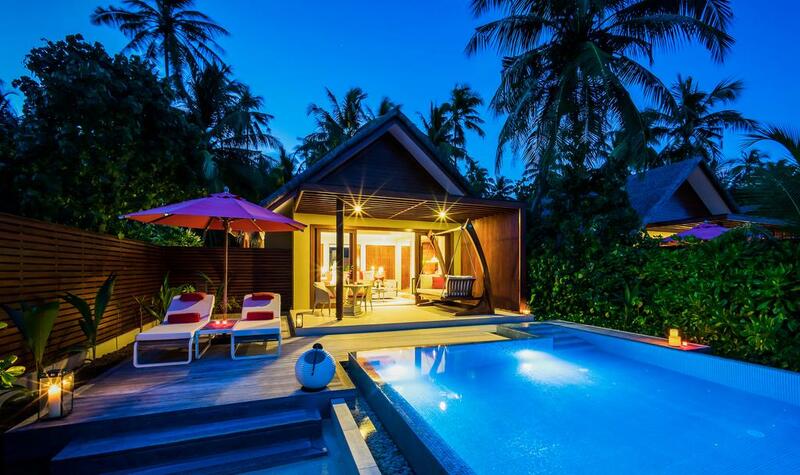 These villas also offer a humidor with cigars and a selection of table games and books. Niyama Private Islands Maldives Three Bedroom Beach Pool Pavilions offer 770 square meters of space and feature king and twin bedrooms with en-suite open-air bathrooms with covered and outdoor rain showers, spacious sunken living areas plush sofas and dining areas with cocktail bars, and deluxe amenities such as in-room entertainment systems with LED TVs, Bose surround sound entertainment systems, and international movie selections and fully-stocked fridges brimming with drinks and treats. Butler’s pantries have extra fridges, ice-makers, microwaves, and wine refrigerators, and expansive wooden decks have stairs leading to the lagoon, two private plunge pools with fiber optic lights and underwater speakers, Jacuzzi tubs, sun loungers, day beds, dhoni-shaped swings and dining tables, and offer direct beach access and 24-hour butler services. Guests enjoy a pampering foot ritual on arrival, and fresh coconuts and cooling box with cold face towels are delivered daily. These villas also offer a humidor with cigars and a selection of table games and books. 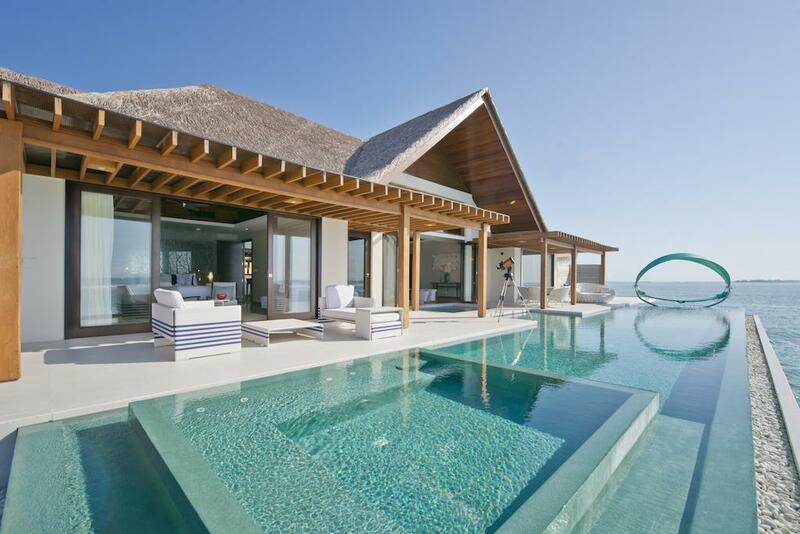 Huddled together offshore, a quintet of extraordinary villas forms a secluded over-water playground. Close to the action but far from the bustle, up to 14 adults and eight children can experience a holiday fantasyland amidst azure skies, turquoise sea. 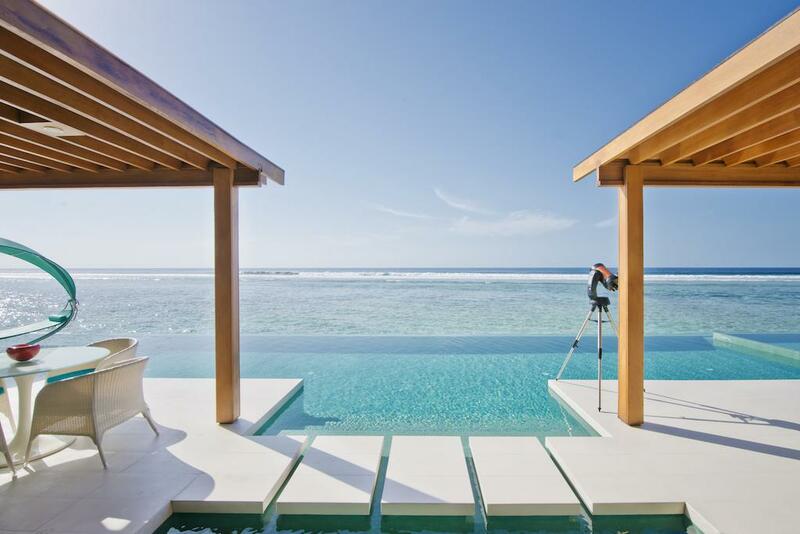 A Two Bedroom Ocean Pool Pavilion, beats at The Crescent’s heart, flanked by two One Bedroom Water Pool Pavilions and two Deluxe Water Pool Villas, all five with private pools. Two dedicated private butlers, a private chef, and a housekeeper keep this island oasis running smoothly. 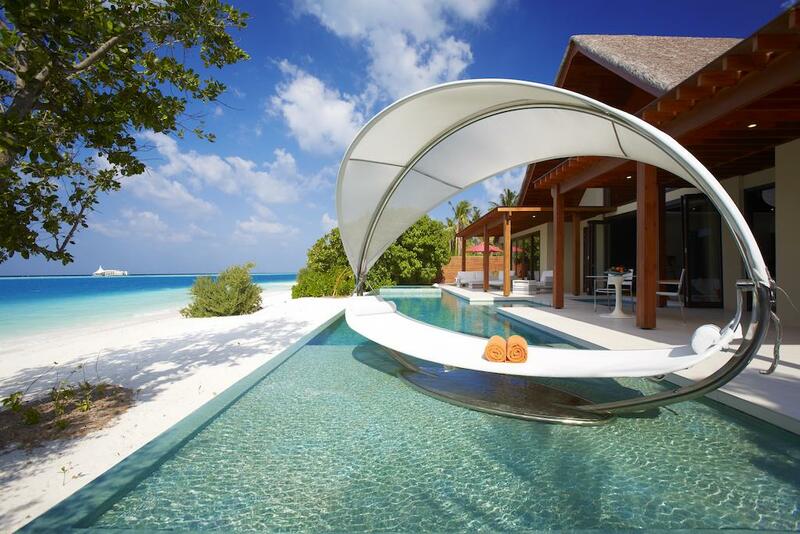 Niyama Private Islands Maldives is home to nine unique restaurants each offering distinct destination dining experiences. Sip cocktails beneath the ocean, soar among the treetops, float over the water, and dance with the flames. 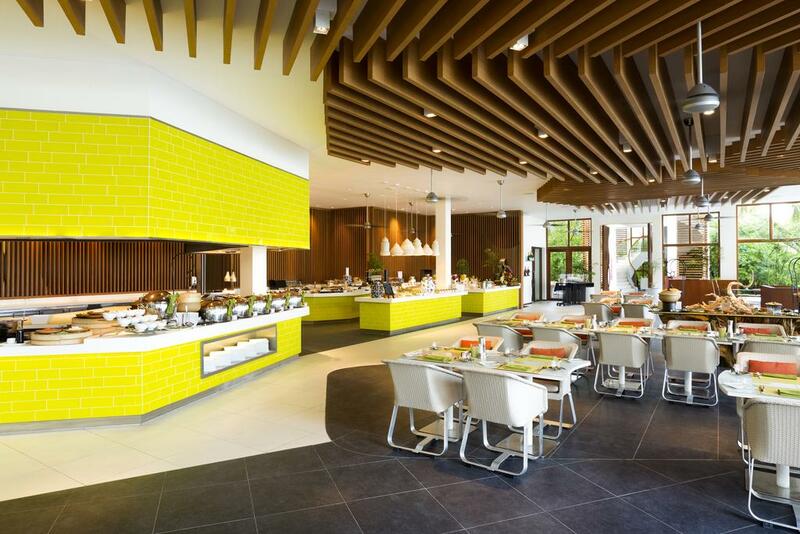 Tuck into gourmet crostinis and thick smoothies for breakfast, and Mediterranean-inspired and Asian delights for lunch and dinner surrounded by tropical splendor. 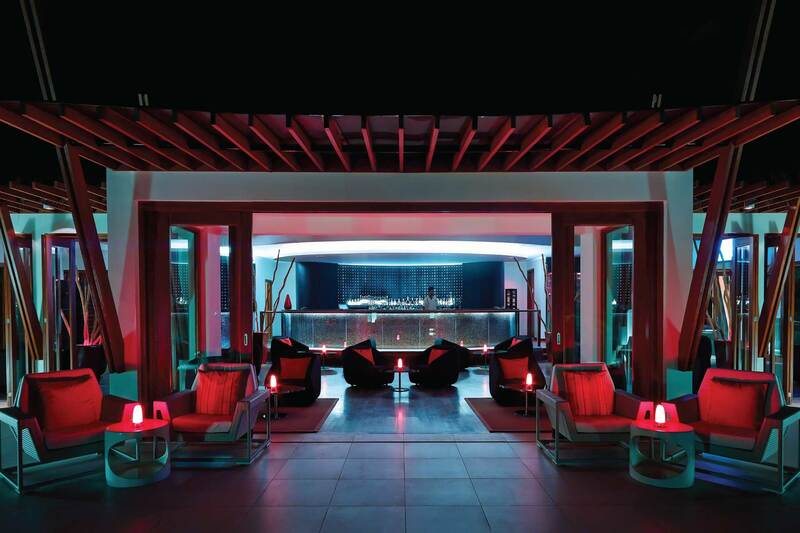 Epicure offers infinity poolside indulgence at its most chic, serving an extensive breakfast buffet to a la carte lunches and dinners, along with a selection of 18 teas and 260 globally-inspired wine labels. Set half a kilometer out in the ocean and accessible only by boat, Edge offers exclusive overwater dining where diners are caressed by soft sea breezes beneath the sweeping white curves of a canopy as they tuck into fresh local seafood, local Maldivian reef fish, and other culinary delights from the Indian Ocean. Navigate the jungle on a labyrinth of wooden walkways to a private perch in the treetops where Nest offers an unforgettable dining high. 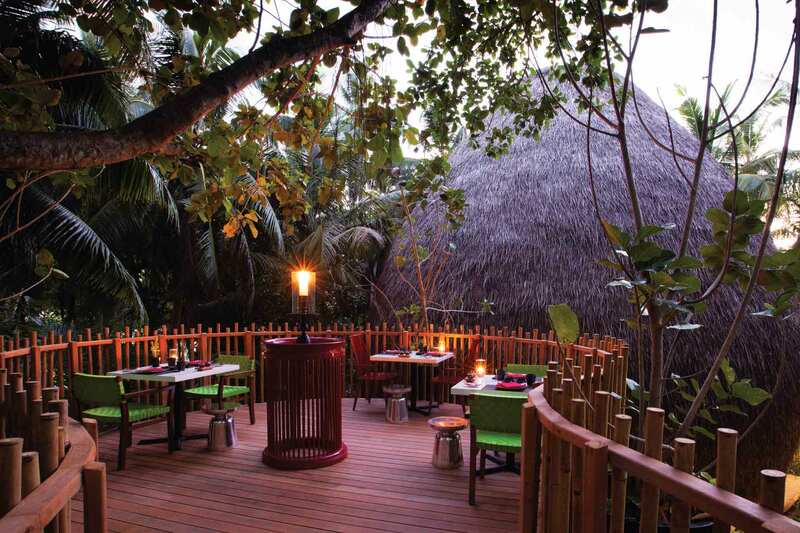 Tucked away six meters above the forest floor between serpentine vines and thick branches, the surreal restaurant serves avant-garde Thai, Chinese, Japanese and Indonesian dishes, fresh sashimi, and handcrafted teppanyaki table, accompanied by recommendations by the Sake Master. Taste the world’s most expensive coffee, Black Ivory along with Nest’s signature dessert of Luwak Coffee Brûlée. 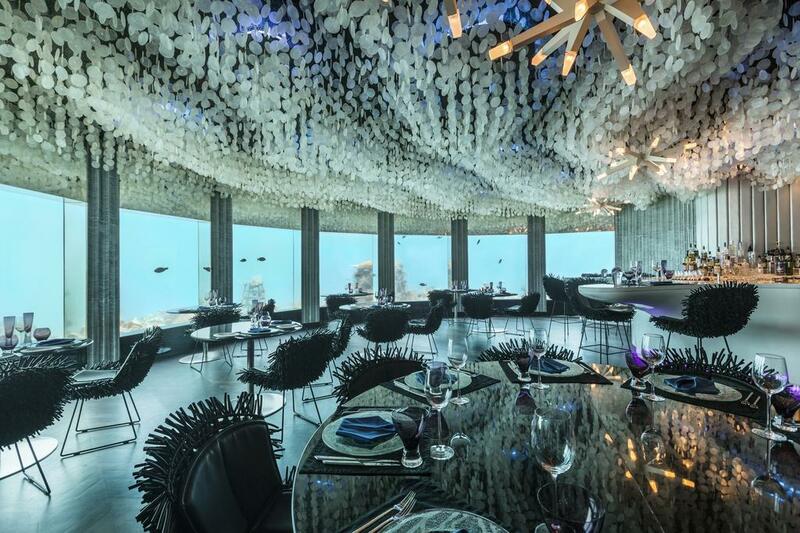 Subsix is another extraordinary dining establishment which rests 20 feet below the surface of the sea. The restaurant is accessed by speedboat and a three-tier staircase that descends into the sea and boasts stunning ocean-inspired décor that complements the breathtaking underwater surroundings. Contemporary design elements include a sweeping curvy clam-inspired bar, soft anemone chairs, wavy capiz shells draped from the ceilings, and Italian abstract chandeliers that illuminate the interiors like glimmering coral. Subsix serves sumptuous Champagne breakfasts, sub-aquatic lunches, and gourmet dinners with sublime menus of chef-inspired creations like swimmer crab with couscous pomelo and ocean foam and lobster medallions with heirloom tomatoes and blackberry essence. 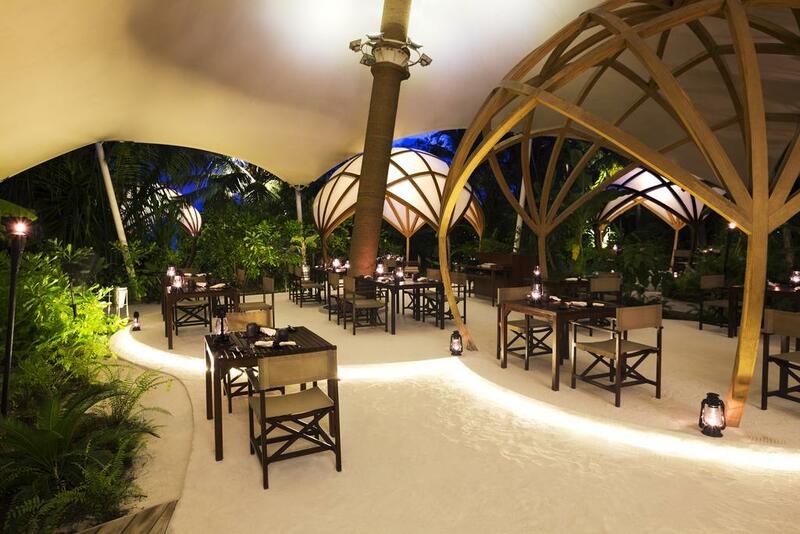 The restaurant also hosts twice-weekly “glow party” club nights where guests can dance the night away against an illuminated backdrop of the surrounding reef and its striking inhabitants. Hidden in the walls of an African boma, Tribal offers a creative menu of African, Central and South American tribal cuisine with signature dishes such as Warm Ostrich Bobotie and the Big Afrikaaner, and ground and roasted Jebena coffee from deep mocha of Ethiopian Harra to fragrant Yrigacheffe. A Maasai warrior welcomes guests to create an ambiance akin to that of being high in the hills of the African continent. 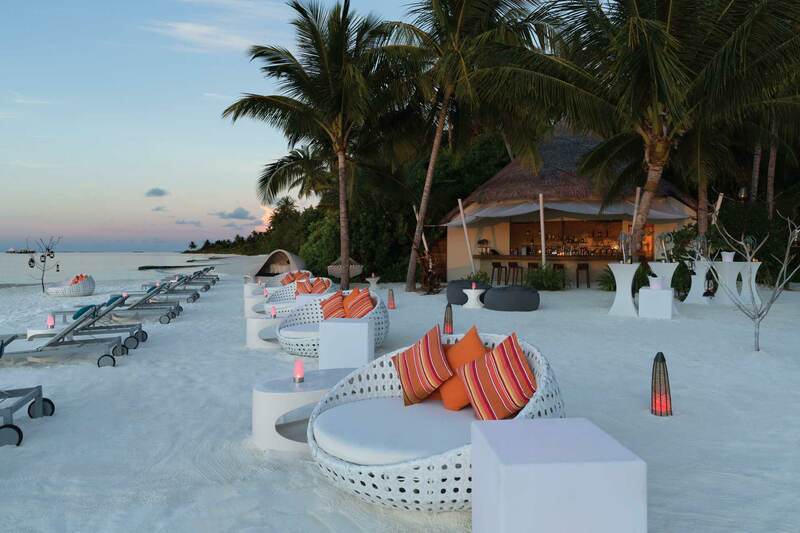 Dune offers barefoot dining on white sands and cocktail lounging on plush bean bags beneath the stars to the backdrop of chilled tunes from a resident DJ. Sip smoking cocktail Meduse, house-aged liquors from on-island oak barrels with fruit infusions, floral liqueur or organic twists. Farenheit’s rooftop lounge boasts glass walls and plush décor and offers the perfect spot to sip chilled cocktails of home-aged rum and soak up the spectacular views. Guests wanting elevated levels of intimacy can enjoy exclusive private dining experiences with personalized butler services in several stunning locales around the island. 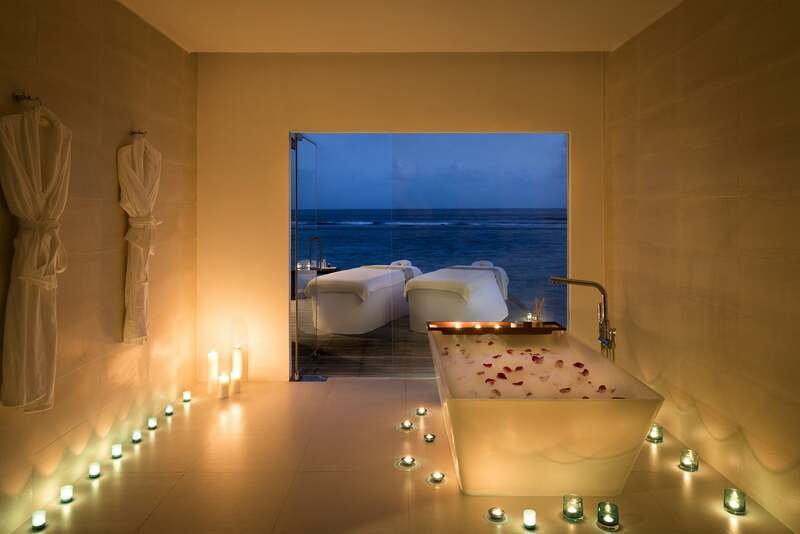 Niyama Private Islands Maldives is home to the luxurious Drift Spa, which specializes in using freshly harvested herbal, botanical, and marine resources to offer pure Maldivian healing experiences. Floating over the ocean on stilts, this luxurious sanctuary at sea features a lush private garden, six over-water treatment rooms with lagoon views, two treatment sanctuaries with private gardens, outdoor baths, rain showers and daybeds, and a relaxation area with a peaceful lime tree garden with sauna and steam baths, plunge pools, Jacuzzis, and a Vitality juice bar. The Drift Spa presents a range of therapeutic massages and bespoke body treatments designed to rejuvenate body, mind, and spirit using products by Anne Semonin, Intraceuticals, Aromatherapy Associates and Margaret Dabbs. The spa also offers salon services such as hair styling, manicures, and pedicures. 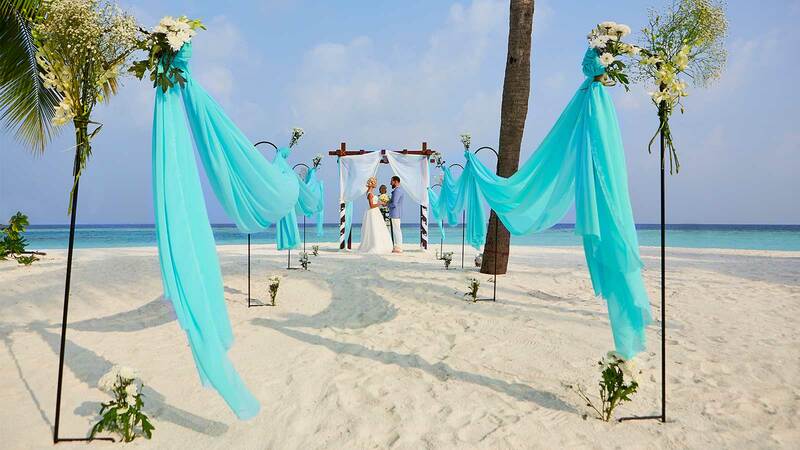 Niyama Private Islands Maldives offers a wide variety of activities, sports, and leisure for all ages, ranging from water sports such as snorkeling, scuba diving, and surfing to cooking classes and yoga sessions. 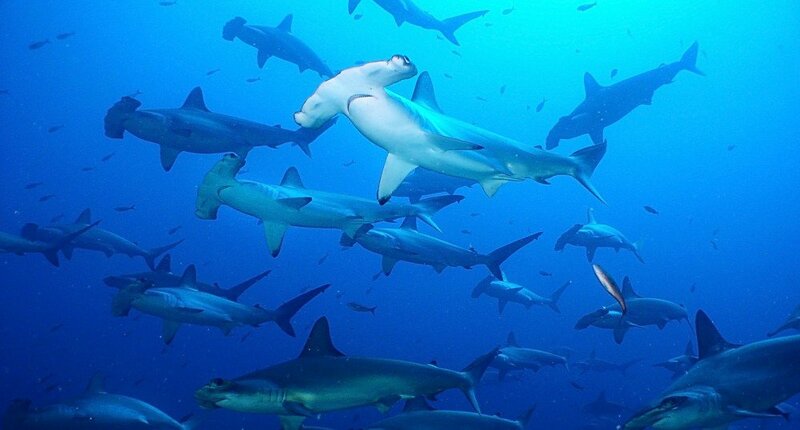 Leisure activities include turtle quests, swimming with hammerhead sharks or manta rays, fluorescent night snorkeling and diving, traditional Maldivian fishing trips, local island visits, and dolphin cruises. Adrenalin-rushing activities include jet-skiing, water-skiing, mono-skiing, wake-board, knee-boarding, catamarans, windsurfing, kitesurfing, parasailing, fun tubes and more. 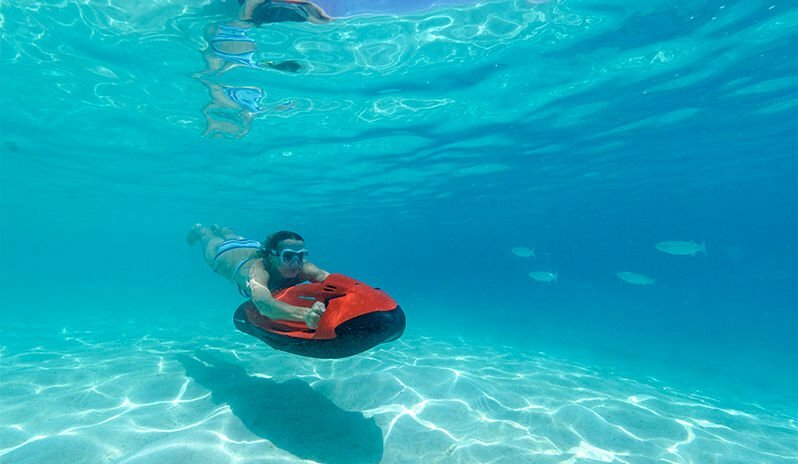 Float on the tranquil waters of the lagoon in glass-bottomed canoes, race under the water on Seabobs, or surf some of the Maldives’ best waves. 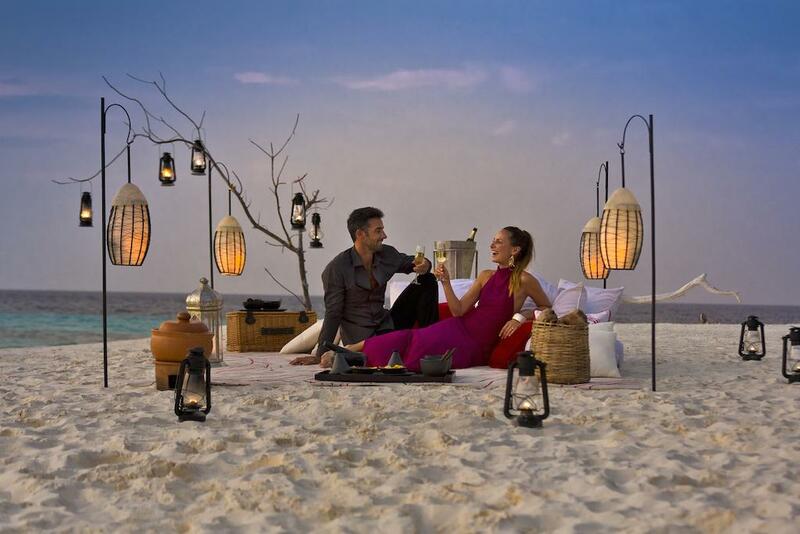 Niyama Private Islands Maldives defines the essence of a romantic wedding and honeymoon with a range of romantic activities for two, including Champagne breakfasts in the privacy of your bungalow or villa, romantic candlelit dinners for two in your bungalow or villa, or on a beach or sandbank, relaxing massages for two, picnic baskets for two, special occasion packages, and customized cruises. 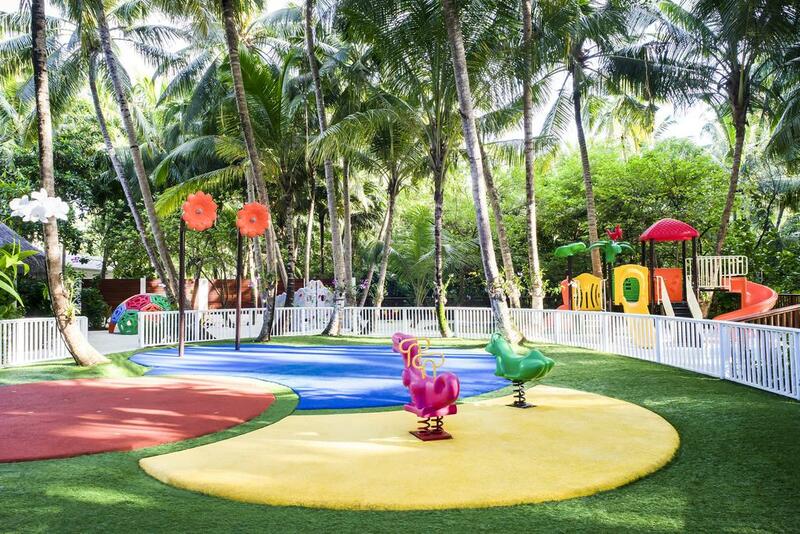 Niyama Private Islands Maldives has an exclusive children’s club called Explorers Kids Club, which offers children between the ages of three and 12 years an opportunity to explore the many delights and wonders of island living under supervised care. 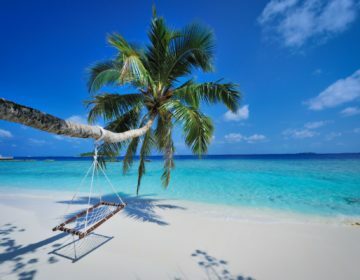 Led by a team of highly trained childcare professionals, kids are shown the rich culture and spectacular natural beauty of the island, as well as given a chance to enjoy some high-energy sports and outdoor activities, ranging from art classes and treasure hunts to snorkeling and educational lessons.